5.1. (a) Give the values for the molecular quantum numbers A and S for each of the five electronic states of molecular oxygen shown in Figure 5-1. (c) Based on the selection rules for radiative absorption given in Section 5.1, which of the four electronic transitions between the ground state of molecular oxygen and the four excited states given in Figure 5-1 are allowed transitions? Justify your answer. 5.3. Punta Arenas, Chile, is located at 53°S latitude, which is at the edge of the Antarctic ozone hole (Section 5.2.3.3). On October 4, 1995, the column ozone concentration was 325 DU; on October 13, it had dropped to 200 DU [V. W. J. Kirchkoff et al., J. Geophys. Res., 102, 16109-16120 (1997)]. (a) Calculate the fraction of solar radiation intensity I/I0 transmitted by atmospheric ozone at 297 nm on October 4 and on October 13. The spectrum of ozone is given in Figures 5-3 and 5-4. (b) Calculate the percent increase in intensity at 297nm from October 4 to October 13. (a) Calculate the equilibrium constant at the temperature of the atmosphere at an altitude of 25 km (Figure 5-5). (b) The pressure of O2 is about 0.005 atm at 25 km, and the concentration of ozone is given in Figure 5-5. Calculate the ratio of the equilibrium pressure of O atoms divided by the equilibrium pressure of O2 (Po/Po2), at 25 km. (c) Would you expect this ratio to increase or decrease in the presence of sunlight? Why? 5.6. Show that the appropriate combination of reactions (5-29), (5-36), (5-37), and (5-39) gives the Chapman cycle, equation (5-41). 5.7. Both mechanisms (5-48) and (5-49) lead to the catalytic destruction of ozone. What is the significance of one mechanism relative to the other? 5.9. What is meant by the polar vortex? Why is it considered to be an essential feature of the Antarctic ozone hole? 5.10. What is the role of polar stratospheric clouds (PSCs) in the formation of the Antarctic ozone hole? 5.11. Explain in each case why the HCFCs and the PFCs have much lower ODPs than the CFCs. 5.12. What is the role of temperature inversion in photochemical smog? 5.13. Although the results of a photochemical smog chamber experiment shown in Figure 5-11 qualitatively agree in many ways with an actual case of photochemical smog (Figure 5-9), there are some significant differences between the two sets of data. In particular, note that the ozone concentration increases to a constant amount in Figure 5-11, whereas it decreases significantly after reaching a maximum in Figure 5-9. Discuss what might be the reason for this difference. 5.14. Calculate the percent of 397.5-nm light that would be absorbed by NO2 in a polluted atmosphere that is 1000 ft thick and contains the maximum concentration of NO2 given in Figure 5-9. Assume the pressure is constant at 1 atm and the temperature is 85°F (29.4°C). 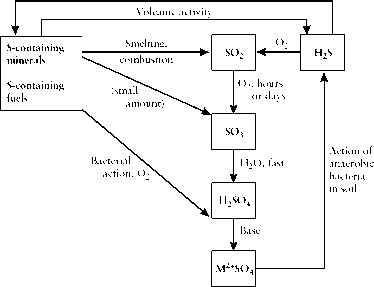 (b) What is the role of VOCs in the production of photochemical smog? 5.16. It is stated that NO2, formed mainly from NO, is the main light absorber in the atmosphere leading to photochemical smog. Give several examples of reactions involving the oxidation of NO to NO2 in an urban atmosphere. 5.17. We have seen that PAN, a component of photochemical smog, is thermodynamically unstable, decomposing into NO2 and the peroxy-acetyl radical CH3C(O)O2" [the reverse of reaction (5-111)]. This reaction is very sensitive to temperature changes; at 25°C the half-life of PAN is 27.5 mins, while at 100°C it is 0.18 s.
(a) Calculate the rate constants (in s"1) at 25°C and at 100°C. (b) Assuming that the empirical Arrhenius equation (4-24) is followed, calculate the activation energy Ea for the decomposition reaction.